– On August 15th, I went to a baseball game with my dad. The company he works at, Xenoport, was having a company outing at the San Jose Giants game, and the tickets were only $2. This was my first time going to a minor league game, and it was pretty cool. Very different from a major league game, from the $2 seats being about 10 rows behind home plate, to the announcers trying to get the crowd and kids involved between every inning, to the $2.50 beers. The game wasn’t amazing, as the Giants lost to the Stockton Ports, 3-2. Still, it was a fun game and definitely worth a return visit. – I’ve since dropped by Cornerstone as well, to see some of the analysts and also some of my old managers. I also picked up my “tombstone”, commemorating the firm’s success on the big JDSU case where Cornerstone assisted with expert reports and trial testimony. The case went to trial in the fall of 2007, and a verdict in favor of the defense was returned after Thanksgiving. The tombstone lists the company name, law firms, and Cornerstone on one side, along with the names of every Cornerstone employee who billed time to the set of JDSU cases. Thanks are in order to Gil Lee for the idea and following through with the idea. – Over the weekend, I visited Merced, to see the new house my brother and his wife bought a few months back. He’s an assistant professor at UC Merced now, and classes start pretty soon. The campus is miniscule compared to Berkeley, but they’re hoping to build it out and model the campus after Berkeley. – My next tournament is coming up over Labor Day Weekend in San Francisco. It’s the annual CalChess Labor Day Tournament, which doubles as the official state championship. Somehow I’ve avoided playing in this tournament for years (the last time I played was in 1999), but as I’m making a return to the chess scene, this will serve as my first tournament anywhere in the Bay Area since 2005. The tournament is at the Golden Gateway Holiday Inn in San Francisco (corner of Van Ness and Pine) with rounds from Saturday through Monday. 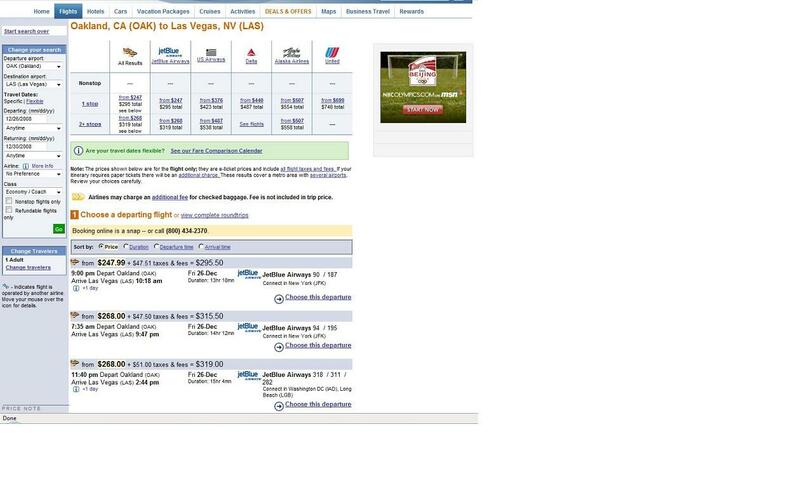 It’s kind of sad that the cheapest way to Las Vegas from Oakland is to first fly a few thousand miles east. The Post-Trip Roundup: Sprichst du englisch? – A last note on Spain, there was an interesting traffic control system in place in Barcelona that I haven’t seen anywhere else. On one of the main expressways, there were 8 lanes in total, but the number of lanes in each direction could change! The way it works is that there are always at least 2 lanes dedicated to each direction of traffic. However, over the middle 4 lanes, there are electronic displays every block (or 50 meters, for example), that say whether the lane is open to traffic in that direction. Thus, during different parts of the day, depending on which way more traffic is going, there can be 5 lanes in one direction and 3 in the other, and so on. I’m not sure what the accident statistics are on such roads, but it seems like a very interesting alternative to using eminent domain in some cases. – My hotel rooms in Frankfurt and Berlin were a study in contrasts. The hotel room in Frankfurt was quite minuscule. Measuring about 10 feet by 10 feet on a good day, it housed a bathroom, a bed, a small table with a fridge below, a closet, and a TV stand (with TV, of course). Generally European hotels are different than their American counterparts, but I think this was the smallest hotel room I’ve had in Europe. On the other extreme was my room in Berlin. For not much more than I paid in Frankfurt, I got a room that was bigger than many I’ve had in the US! The entry and bathroom area were about the size of my room in Frankfurt, with the main room being about twice as big! – Speaking of hotels, there was an amusing day in the Hotel Balaguer in Spain (I guess that wasn’t the last note about Spain after all). I had washed some clothes in the room and hung them from the towel rack to dry. This meant that when the maid came to clean the room, she couldn’t put them on the rack. So where did she put them? Not on the bed, or on the chair, or anywhere else I might have expected. Instead, she put them in the bidet. Yes, the bidet … the place where you wash your arse. Luckily I had stored a second set of towels in the closet. – Taxis in Germany are quite different than those in the US. I noticed that most are expensive Mercedes or Audis, and the drivers keep them very clean. The other cool thing about German taxis is that the fare meter is often built into the center rearview mirror. Here’s what it sort of looks like (from http://www.radtax.co.uk/category.asp?p=digitax+meters). – While in Germany, I didn’t really eat much German food as what I know of the cuisine isn’t all that forgiving for vegetarians. However, the big cities all have a diverse selection of ethnic cuisines, and I generally ate at Indian, Italian, and Turkish restaurants. In fact, Doner Kebab has taken over as the national fast food in Germany. The Indian food I ate was generally pretty solid, but not at all spicy – I suspect it’s because they cater to the German palate. At one restaurant in Munich (Swagat), I even managed to ask for a plate of chilies on the side. For anyone going to Frankfurt, I would recommend Manolya, a Turkish restaurant in the Bornheim district. – On that note of eating out, I didn’t speak any German beforehand, and as I hadn’t prepared to be on my own in Germany, I didn’t have any guidebook or phrasebook to help me out. I did download a free English-German dictionary (from FreeLang.net), and I also used the phrases “Sprichst du englisch?” and “Ich spreche kein Deutsch” quite often. Luckily for me, most people in the big cities spoke some English, with the younger generations generally speaking quite fluently. In the restaurants, though, when I was eating at Indian or Italian restaurants, I got to make use of some Hindi, Italian, and even Spanish! I do plan on learning a bit more before I return for Mainz 2009 though. 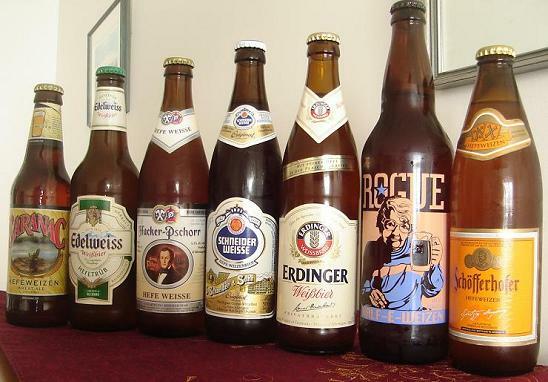 – There is a lot of beer drinking in Germany. I generally stuck to standard Hefeweizens and Weissbiers, but occasionally strayed to the darker wheat-beers (Dunkel Hefeweizens) and black-beers (Schwarzbier). But even after a couple weeks, it was amusing to step onto a Berlin U-bahn and see a couple workers off to the job enjoying a beer at 9 AM. Also, most Germans frown on the idea of putting a slice of lemon into a regular Hefeweizen (amongst other things, it completely destroys the head and dominates some of the flavors in the beer). I only noticed some people using a slice when drinking a Kristalweizen. This is a bit late, but I only just got back from Germany and didn’t have much internet access in my hotel rooms. About a week after Balaguer finished, I went to Mainz for the Chess Tigers Mainz Chess Classic 2008, a huge chess festival that draws close to a 1,000 players to the city over 7 days. I had spent the interim period in Munich (4+ days) and Frankfurt (2+ days), and then took an S-bahn train to Mainz. The first tournament on the docket for me was the FiNet Chess960 Open. A rapid event, the games are played at a rate of 20 minutes for each player, with 5 seconds added per move. The twist is that it’s Chess960, and so the starting position is randomly selected from the 960 possible arrangements of the pieces on the back rank (there are only 960 positions because the rules do not allow positions where both rooks are on the same side of the king). The tournament was played over 2 days, with 5 rounds on the first day and 6 rounds on the second day. This can make for a somewhat tiring event, as even though it’s rapid chess, each game can easily take 30-40 minutes, and then that is repeated a number of times each day. Even in the so-called rapid World Championship in which Anand, Carlsen, Morozevich, and Polgar participated, it looked like by the last games of each day, Anand was not calculating nearly as well as at the beginning. Anyways, in the FiNet Open, I was seeded number 41 of about 232 players at the start of the event. The first day, I lost to GM Rustam Kasimjanov (2004 FIDE World Champion) in horrible fashion, dropping a center pawn for absolutely no compensation after less than 10 moves. This was my only loss of the day, leaving me with 4/5 going into the second day. I started off with a loss to GM Evgeny Bareev (former super-GM, and second of ex-World Champion Vladimir Kramnik in multiple matches) in a long, hard-fought game. The disappointing thing with this game was that I had a worse position, fought back, and then blundered horribly at the end to throw all my hard work away. Again I beat up on the lower rated (at least at regular chess) players, and then faced GM Pavel Tregubov (a former European Champion) with the white pieces. I played enterprisingly in the opening, sacrificing a pawn for good compensation, but then I began to play poorly, miscalculating lines at every move. Tregubov finished me off with a nice queen sacrifice to set up a mating net. I beat a lower rated player again, and then finished the tournament off with a smooth win over GM Murtas Kazhgalayev. Thus, I finished with 8.0/11, good enough for a tie for 9th through 18th place, with my mathematical tiebreaks being good enough for 16th place overall. GM Hikaru Nakamura won the event on tiebreaks with 9.0/11, although he should have won the event in sole first had he not thrown away a drawn endgame against GM Arkadij Naiditsch in round 10. Naiditsch then returned the favor, throwing away a complete win against Motylev (up a queen!) and blundering into checkmate in the last round. After the end of FiNet Chess960 tournament, the Ordix Open began the following day. The time control was the same (G/20 + 5 sec/move), but with the standard starting position. Some of the players had been joking during the FiNet tournament whether the organizers could randomly select Position 518 from the list (which corresponded to the regular starting position) – now we got a chance to play 11 rounds of that. The first game was a bit weird, as I had gotten more used to playing with my pieces in their non-standard starting squares over the previous couple days. However, I beat all the lower rateds until I was paired up in round 4 with GM Hikaru Nakamura, the favorite (at least in the eyes of most people I talked to) in the event. With the white pieces, we played a very long game that ended in a draw, although I really should have won the game. The game was a bit of a see-saw at first, with neither playing getting a winning advantage, but then in the rook and pawn endgame, I steadily outplayed him to get a won position. However, I then erred a little bit, and then in the final position with only one move to win, I didn’t see how to proceed and took his draw offer. That game can be replayed here. After the first day, then, I was sitting on 4.5/5. The second day, I started off with a tough loss to GM Davit Arutinian. I then won a pair of games before getting clobbered by GM Tomas Markowski of Poland. Like my game with Kasimjanov, this was a very disappointing game because I essentially did not put up a fight. After the opening 12 moves or so, I was just clearly worse having lost a central pawn for little compensation. Markowski then managed to put me away, leaving me on 6.5/9. Had I won the game, for example, I would have been in contention for first place with 7.5/9. Over the last two games, I managed to get back on track, beating WGM Anita Gara and GM Robert Ruck of Hungary, the win against Ruck being particularly nice. And so, after 2 more long days of chess, I finished with 8.5/11, good enough for a tie for 12th through 24th place, with my mathematical tiebreaks being good enough for 19th place. The Ordix Open was won by Ian Nepomniachtchi and Pavel Eljanov on 9.5/11, with Nepo’s tiebreaks being better. Nakamura finished with 9.0/11 after losing a won game against GM Zoltan Almasi in the tenth round. However, he still managed to win first place overall in the combined score list (with 18.0/22 across the two events). After the end of the normal open tournaments each day, the crème de la crème fought it out in the evening. Billed as the Rapid World Championship, it’s not officially sanctioned, so I think it’s a bit disingenuous to call it as such. Still they always get some of the strongest players in the world to play, and this year was no different. It started as a double round-robin with Anand, Carlsen, Morozevich, and Polgar. The top two finishers would then play a 4-game match for 1st/2nd place, and the remaining two would play for 3rd/4th place. Anand finished ahead in the round-robin phase, beating Morozevich twice and then drawing with everyone else. Carlsen took second in the round-robin, and so faced Anand in the final stage. However, he got completely crushed in the first game (foolishly playing the Sicilian Dragon again) and lost the second in poor fashion after playing a very insipid Catalan. After missing a ton of opportunities, Morozevich finally beat Polgar in their match. Surprisingly (or not), Polgar went through 10 games without a single win. The chess was somewhat disappointing, with everyone except for Anand looking particularly mortal. Carlsen’s opening play never really got him much; Morozevich did not quite seem on form, missing some tactical lines that I would have expected him to normally see; and Polgar just looked completely outclassed. Watching the players, though, was somewhat more interesting. Anand plays without showing too much emotion, although he does fidget around a little bit during all phases of the game. Polgar and Morozevich were rather stoic, although Morozevich would show his disappointment with his play more often. Carlsen was the most interesting to watch, because it almost didn’t look like he was playing a game. He would often look at the other board during the game (even on his own move), would sit in a much more relaxed fashion than any of the other players, and so on. The only time he looked a bit distressed was after losing the first two games of the final to Anand. In those cases, he ran off the stage to a side door. ChessBase had a final report on the Biel 2008 tournament, with some amusing photos of Carlsen. Here they are, along with a link to the ChessBase article. He was doing the same sort of stuff in Mainz. It’s too bad you never see such events in the US – from the champions tournaments, to the massive turnouts in the open events (with such strong fields), to the packed spectators area for the evening matches, it was lots of fun. I definitely plan on returning next year.